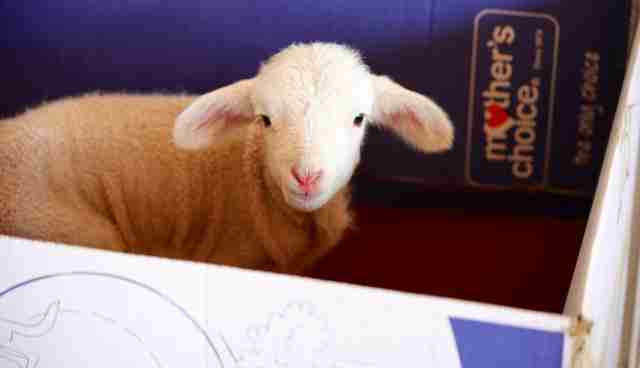 When a 4-day-old lamb named Carl arrived at the animal sanctuary, he was weak and wobbly, and missing his mother. 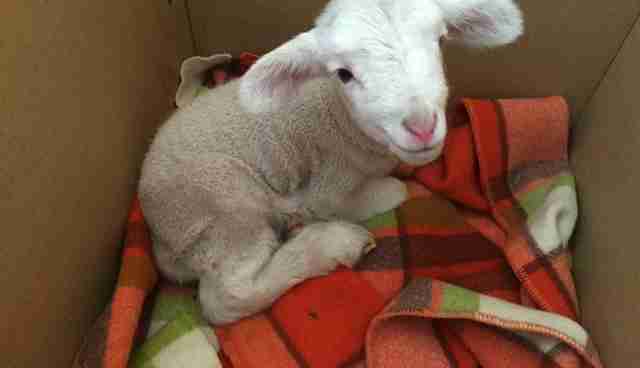 A family had found the little lamb in a field near the Flinders Ranges in South Australia. Carl was in bad shape, and his mom was nowhere to be seen, leading the family to believe the mother sheep had died. The family tried to "give" the lamb to a few sheep nearby, hoping they'd adopt him, but the sheep weren't interested. 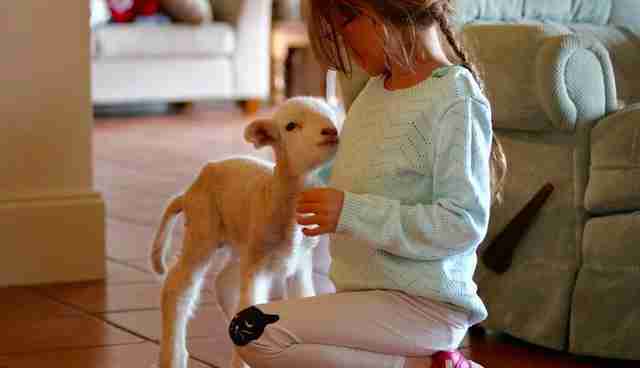 So the family took the lamb back to their home in Adelaide, then contacted Freedom Hill Sanctuary, which agreed to take the lamb into its care. 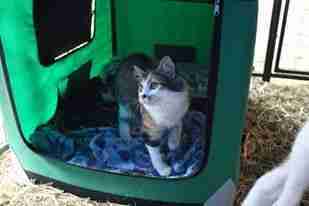 The family placed him in a cardboard box and drove him to the animal haven. It's possible it was the cardboard box that attracted a rescue cat named Mangoes to Carl, since cats, you know, seem to have this thing for boxes. 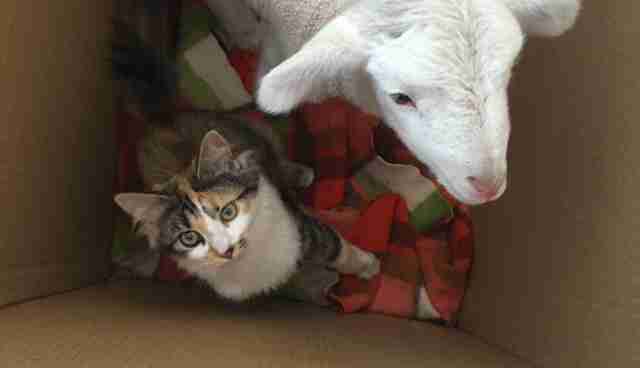 But when Mangoes leapt inside and found a bleating white lamb, she didn't scurry away. 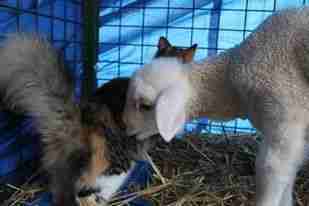 Mangoes stayed, allowing Carl to shove his curious lamb nose into her fur. 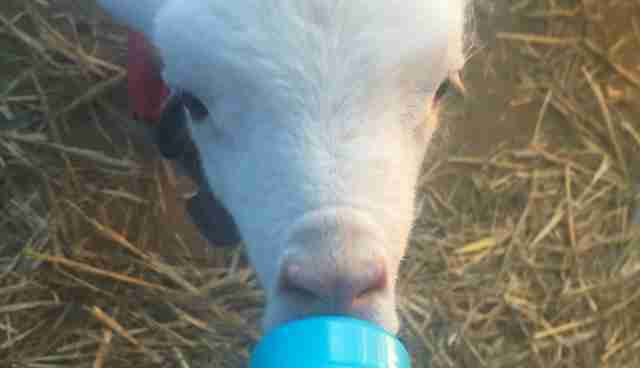 Carl was so young he needed to be bottle-fed every two hours, so Kelly Dinham, the cofounder of Freedom Hill Sanctuary, kept him inside her house. With Carl being housebound, a strong bond formed between him and Mangoes. "Mangoes would jump into Carl's house every time he had a bottle," Dinham tells The Dodo. "I think she was trying to make him feel comfortable in his new home." While Carl and Mangoes share a particularly special relationship, Dinham explains that Mangoes likes all lambs: "She likes welcoming the new lambs to Freedom Hill. Mangoes arrived in our care at a very young age, and has just adapted to having new lambs arriving all the time." 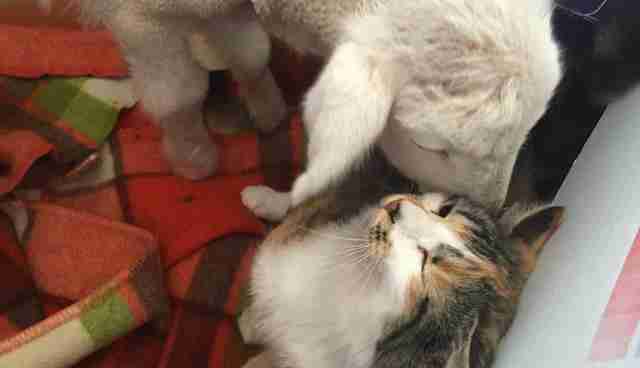 Mangoes may like lambs, but they're not all crazy about her. "Alisha didn't like Mangoes at all," Dinham says with a laugh. "Carl was the only one who seemed to enjoy Mangoes' company." Since arriving at Freedom Hills, Carl has become stronger and healthier. 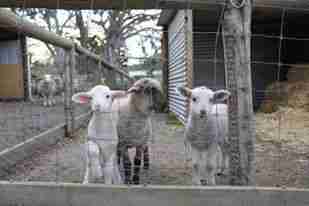 "He's now moved from being inside the house to out in the kindergarten area with the other lambs," says Dinham. "He's friends with Alisha and Frankie." ... and even settles down for a nap in Carl's straw bed. But these two besties won't always get to hang out. 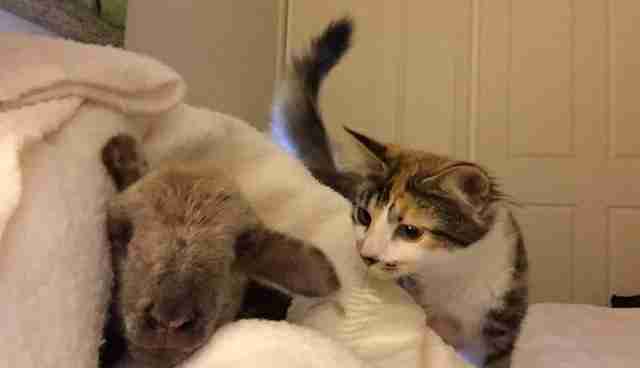 "Carl and his lamb friend Frankie have moved to live with a lovely couple with a small vegan sanctuary not far from Freedom Hill," says Dinham. 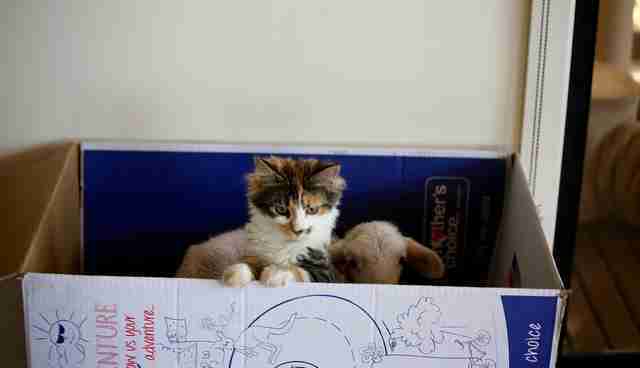 "Adopting these lambs out to a loving home makes way for more lambs that need our love and care. Plus more lambs for Mangoes to welcome too!" 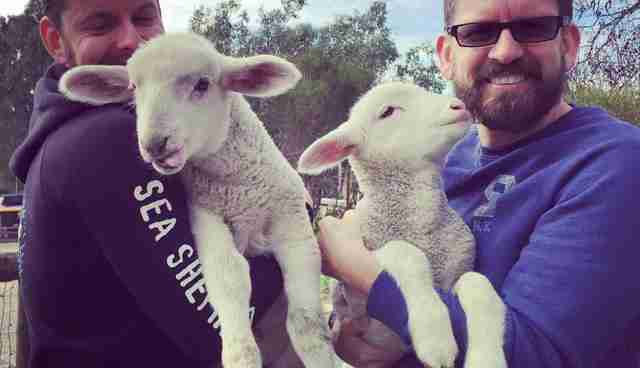 Freedom Hill Sanctuary has raised over 37 orphaned lambs since the sanctuary began in 2011. It is the home to over 40 permanent sheep residents, 12 cows, 10 goats, eight horses, 50 chickens, three turkeys, four pigs, nine cats, four dogs and one deer. You can support Freedom Hill Sanctuary by donating here.